The digital age brings with it the promise of micro observation and indefinite memory. This will bring about a different approach to history - similar to what Tolstoy described one and a half century ago. 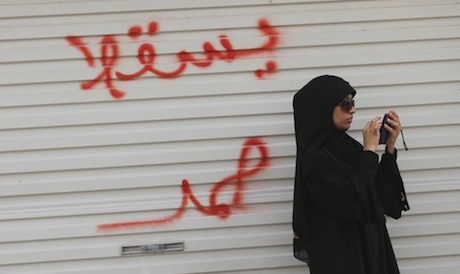 Tweeting against the government in Bahrain. Demotix/AF-Bahrain Revolution. All rights reserved. In his epic novel War and Peace, Leo Tolstoy sets out his vision of history. Drawing on the analogy of integration in mathematical calculus, Tolstoy believes historians’ use of discrete events and distinguished personalities to represent the continuous flow of history is doomed to fail. The ocean of individual actions that shape the course of history leaves no place for grand leaders like Napoleon. History must travel down the road exact sciences must take: only by entering the process of the integration of infinitely small quantities - the innumerable arbitrary human wills in the case of history - can we hope to arrive at the laws governing history itself. With successive generations of technological advance, we have moved from a world in which history exists in perishable documents and objects to a world in which information can be stored permanently. In the 1930s and 40s, the microfilm stirred the imagination of visionaries such as H.G. Wells and Vannevar Bush. The Wellsian world brain envisions an efficient index to all human knowledge, ideas and achievements, that is, a complete planetary memory for all mankind. Bush predicted that new forms of encyclopaedias, with a memex structure similar to today’s World Wide Web, would perfect man’s command over the inherited knowledge of the ages. But having efficient storage and retrieval of the human memory is not enough to arrive at “the laws of history”. To achieve that, we need to be able to take the “infinitesimally small units of observation.” It is really the advent of the digital age that triggers a new paradigm for history. The observation and recording of history is no longer the privilege of national leaders and the elite few. Tolstoy concluded that historians of his day have captured, “perhaps only 0.001 percent of the elements which actually constitute the real history of peoples.” Today, the raw material to achieve Tolstoy’s vision of history is here. In 2011, some two billion people, or nearly a third of humanity, are connected to the Internet. Digital activity will be epiphenomenal alongside every social evolution or revolution. It just so happens that many of us are now armed with mobile phone cameras or touch screen keyboards. The unprecedented age of user-generated content is fuelling an exponential growth of the human memory. 90 percent of the world’s data today has been created in the last two years alone. In every Internet minute, 100,000 tweets are created on Twitter, 3,000 photos are added to Flickr, and 30 hours of videos are uploaded to YouTube. Yale computer scientist David Gelernter thinks that the internet could be “the most powerful device for understanding the past,” if historians can assemble and gradually refine timelines of historical facts from the streams of images, videos and texts. The realisation of it would move us closer to the vision of microhistory that Giovannie Levi put forward: “phenomena previously considered to be sufficiently described and understood assume completely new meanings by altering the scale of observation.” But even the idea of macro can change. Cesar Hidalgo from the MIT Media Lab thinks that the digital age allows us to see the big picture without losing the individuality inside it. It helps recover the humanity of a world in which representations of people have become dehumanised through aggregation and exclusion. History is undergoing the transformation of being digitised, while a past tense is emerging for the internet. In the 2011 uprising and ouster of Hosni Mubarak in Egypt, tweets were the “first draft of history”. The book Tweets from Tahrir brings together a selection of key tweets from young people who documented the complex narrative that unfolded in Cairo using their cell phones. History has never been written in this way before. But recent research by computer scientists suggests that history, as recorded by social media, is slowly leaking away. This information decay could simply be due to websites being shut down, or archivers charging for access. Therefore, as societies are producing more and more artifacts in digital form, efforts to preserve them in open formats for future generations are equally important. The Internet Archive, a non-profit digital library founded in 1996, has archived about 150 billion web pages. The US Library of Congress started its digital preservation programme in 2000; and in 2010, it revealed a plan to archive every public tweet since Twitter’s inception in 2006. More similar digital-archiving programmes are being implemented in other countries. Tolstoy offers us no guidance on how one might search for the laws of history; he has only shown us the road historians must take. But we can be sure that we have already embarked on that road. Historians will be able to develop a whole new historical approach, one that will capture the most real and immediate experience of human beings. When we allow for the infinite, truth may be found.